The theme for our sixth and final Riverside Meeting was Water Resources / Land Use. 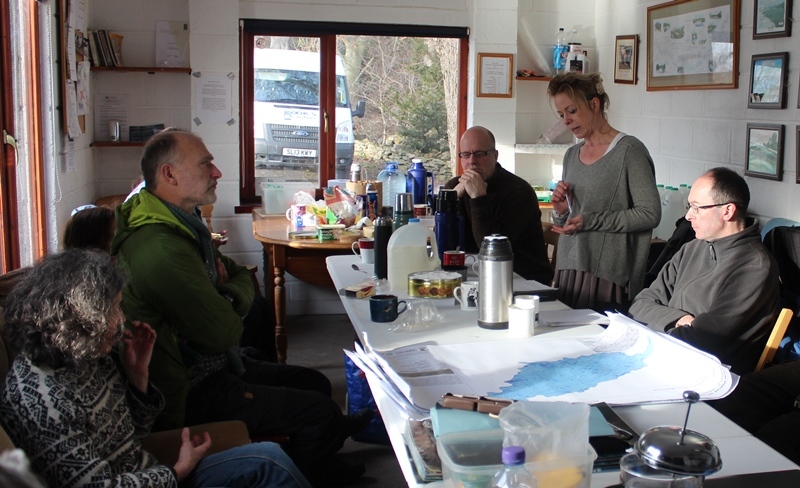 It took place at at Lees Fishing Shiel, Coldstream on January 21st 2014, and the speakers were Dr David Welsh (Historian); Derek Robeson (Senior Project Officer, Tweed Forum); Mary Morrison (Creative Leader, CABN). 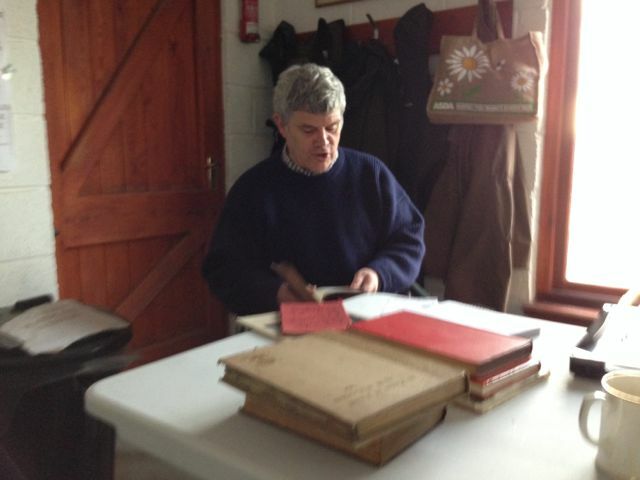 The Lees Fishing Shiel provided welcome warmth and shelter, and our project tables were unfolded for books, papers and refreshments. The view over the river towards England gave plenty to think about, from riparian boundaries to debatable territory. A goosander, a cormorant, and a flock of guinea fowl were feeding along the river, where a salmon leapt, with intermittent shots from a goose scarer. This final Riverside Meeting focussed on strategies currently being developed in the Scottish Borders for both land use and culture. The session as a whole provided a challenge to how artists can work with complex histories and geographies, and engage with uncertain futures. Dr David Welsh opened with a review of how the Tweed has been represented historically. Accounts such as Herbert Maxwell’s ( The Story of the Tweed), or WS Crocket, (In Praise of the Tweed); in poetry, by Scott and Will Ogilvie, and in painting, eg by Scott, Kerr and the Glasgow Boys. But what of contemporary representations? These do include of course taxidermy, as illustrated by the walls of the bothy displaying a trophy. Teasingly, David suggested that the fishing pool map could benefit from artistic accuracy. It takes a specialist eye to know what needs to be corrected. The border between Scotland and England was often portrayed as being created as a result of wars between these two entities, but David pointed out that the current border had much earlier roots, largely having been established by the 12th century as a result of disputes between much earlier kingdoms and power blocks, including the monastic communities at Lindisfarne, the kingdom of Strathclyde and even Welsh kingdoms. So, a bit like the landscape itself, the way history is presented is itself subject to cultural vagaries. David posed a question: where are there contemporary artistic renderings of the border between Scotland and England? His wealth of detailed local knowledge of river and field told of flux and flow, for example the field name of Dry Tweed (East, Mid and West) marks a changing river course, and helps explain anomalies, such as why plots of land to the south of the river are Scottish. Possession of the river banks can be traced in records, and far from smoothing out anomalies, the border has the capacity to become more complex, and remain debatable. He pointed out how difficult it had been to resolve land ownership disputes, with England and Scotland having different legal systems. Thus, if a case were to be heard in the Court of Session in Edinburgh the automatic presumption would be that, since the court there could only rule on matters pertaining to Scotland, that the ownership was Scottish, and if the case were to be heard in an English court the ownership would be presumed to be English. There was a great history of debatable lands. Developing a Land Use Strategy is a daunting task, given the scale of the problems. Derek Robeson of Tweed Forum is Project leader, piloting this for the Scottish Government in partnership with Scottish Borders Council. Convincing people of the need to change habits of land management is the main tool, and Derek’s experience of working with farmers on integrated land management for over 20 years gives him great authority. A sustainable Land Use Strategy means dealing with wider issues (including climate change – more extreme weather events; food scarcity; biodiversity loss) within the very varied localities of the Scottish Borders. The Land Use Strategy is one of only two pilots in Scotland, and Scotland is almost unique in the world in developing a Land Use Strategy, with only two other countries in the world having done this. 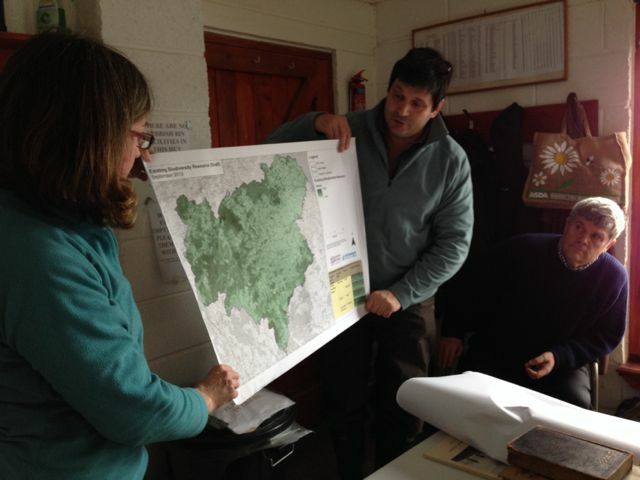 The strategy is largely map-based, and Derek presented a number of maps, such as maps of biodiversity hotspots and current farming use of the land. The strategy needs to be supported by those who manage large parcels of land, but Derek pointed out how everyone is implicated, as decisions made affect all in the area. 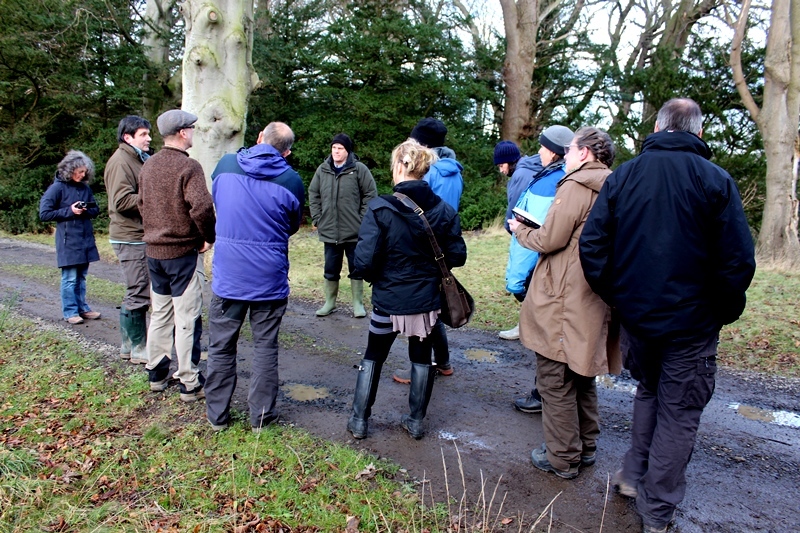 Subsequent discussion included how the idea of ecosystem services underpins the process, which means that (for example) a deciduous woodland might become more ‘economic’ if the full value of its ecological contribution is recognised. 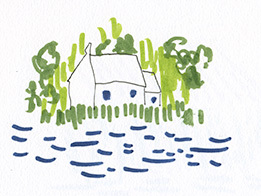 On our walk along the river bank, Derek encouraged the idea of 100 year planning (at least!) for woodland is to take shape, but the political reality is that 5 years is as far as policy can often manage. Field and river margins offer a study in how people shape land, and make choices for aesthetic as well as economic reasons that have wider impacts. Copses of trees were originally planted to provide fox coverts for hunting and as shelter belts, but now provide cover for pheasant shooting and,with the recent changes in the weather patterns in the Borders to much wetter winters, help prevent soil erosion – especially helpful on the steepest slopes which are more prone to soil erosion secondary to water run-off. Mary Morrison of CABN provided an overview and a commentary on the draft Cultural Strategy (link) for the Scottish Borders. 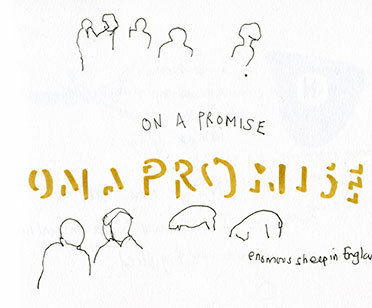 This new venture should act as a basis for supporting the cultural sector development. Recognising that creativity is (and should be) unruly, what can be said about the strategy overall? Mary noted that it took place-making as a creative task, and also that there was mention of ecology and land use, though this had been developed in isolation from the land use strategy. Claire Pençak suggested discussion could tease at the idea of cultural landscape, and the idea of a land ethic (as articulated by Aldo Leopold – quote in box) ran through the points we covered. James Wyness pointed out how the Borders region is not a homogeneous cultural entity, and how folk from the coast identified themselves with other coastal communities rather than with ‘the interior’. James Wyness spoke about how not all art results in a material product, and how one strand of current arts practice looks at processes between people, so that an outcome might be a meeting or a performance. Jules Horne reflected on the term ’Land Use’ and its implication of who Land is used by – People. 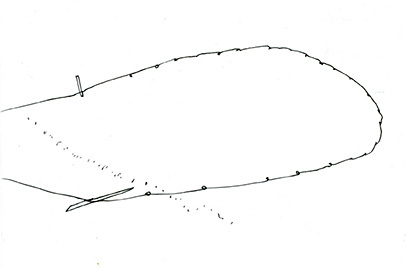 Claire reflected on the possibility of mapping from other perspectives – Otter for example. Maps as used by the Land Use Strategy attracted interest. Firstly the one about Place seemed to have a very restricted scope. It locates places visited, constructed as tourist sites, protected or designed. Not even wildlife reserves or walks (Abbeys Way for example) were represented. Secondly, Claire said she found them too static. However Derek assured her in combination they can show change. Mike Scott commented that if one issue stood out to bring people together to consider land use, it would be flooding. What follows are further points in the discussion Kate picked up on (comments welcome – this is not intended as a complete record). Land Use and Land Reform are separate in ongoing political processes. But, we realised how large estates do play a large part in shaping land use and can take the long view, but breaking them up might not have positives in terms of sustainable land use, as forcing landowners to sell might result in land being traded as an international commodity and managed by people with no interest in the life of people in the Borders. I learnt from this line of thinking, and also Derek’s description of the ‘taste’ of the Tweed being sugar, and slavery’s role in developing large country estates, whose design is an aesthetic standard to this day. Aesthetics play a large part in shaping decisions about Land Use, but neither strategies articulate this very specifically (though Social is included in Land use). 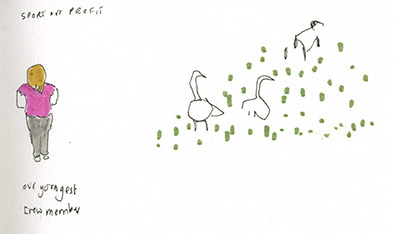 Derek’s comment that what looks good is often good is fascinating. How do we learn to see? to see differently than received ideas? What allows people to see process, to understand abstract shaping influences? How can this be reflected in art practice? Anthropocentrism means, for example, that place can be constructed as entirely for humans, which closes down insight into people within environment, with tangled and complex interactions. Following on from this, what happens in the Borders should be placed within wider social and ecological contexts that take the debate beyond just the Borders region and narrowly human concerns. We need conceptual and poetic tools to allow us to engage with such complexity. Perhaps artists in rural areas have a tacit knowledge about people within environment, and being assertive about the value of this knowledge is important. This is undermined If values of success are imported from conventional art world that bases it’s notions of worth on an urban sensibility. This leads on to thinking of the arts community in the Borders as having a distinctive competence that is different, but no less valuable, from those who work in a largely urban setting. An example would be the project of ‘Working the Tweed’ that allowed for productive and sustained conversations between artists and a wide variety of land users. 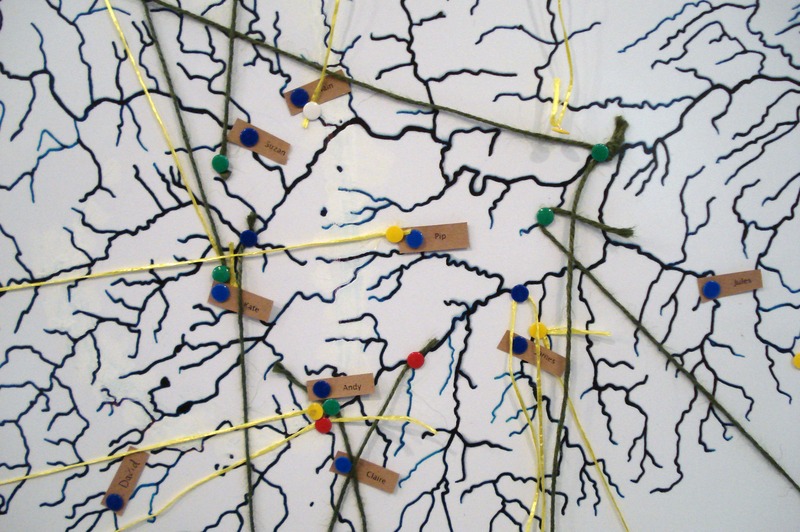 Ecosystem services contains idea of exchange and value, and this could be a vein for artistic production. Symbolic action, the notion of process and also exploration of sensory experience through moving, are expected outcomes for performance and dance, but not necessarily part of a visual artist repertoire. Working across art-forms in the project Working the Tweed has allowed public engagement to include visual props with performance, or listening in abstract to exist alongside detailed attention to words used. River culture should inhibit fixed viewpoints, but help make suggestions about aesthetic choices and possibilities of ecological action. 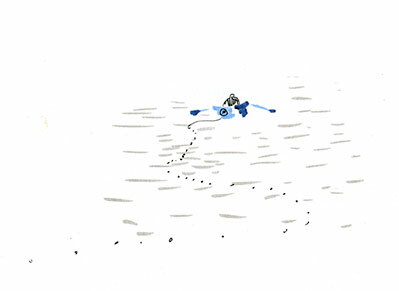 We watched the nets being laid out across the tide, learning that some fish ‘cheat the net’. What, I wonder is the N for, on the coble’s stern? 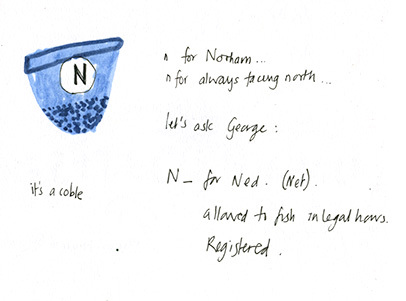 N … for Norham? The coble’s fishing port?We talk to a bailiff. The possibility is raised that it is labelled N because the boat always swings North – just like a magnet. We talk to the boat owner. N, for Ned. No, NET. 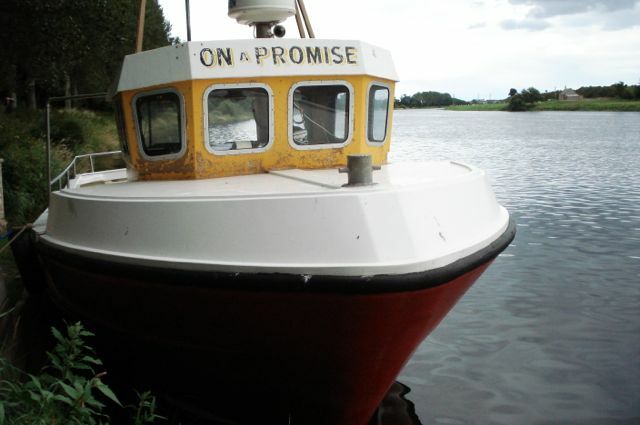 Another boat arrives, I am excited: we will sail with the falling tide, on brine, to Berwick-upon-Tweed. I can’t help noticing how big the sheep are, in England. Sport not Profit, a notice on our vessel remarks. Swans, herons, cormorants. Our youngest crew member is disappointed that nothing pink is visible on the banks. So many shiels that need saving! Ninety six altogether on the river we are told: some are just a pile of stones though.We also learn about the bridges: the by-pass bridge built in 1885. The concrete cast bridge from 1935. The railway bridge, the longest in its day in 1850 – opened by Queen Victoria. She thereafter closed the curtains in Newcastle as she travelled by (because refreshments at that station made her late for her Berwick bridge appointment). And a much much older bridge, built by an early King, who was afraid that the tide and wind would prevent his return to London. We ourselves land, in sunshine and calm seas.